I’ve been enjoying some much-needed vacation time this summer, complete with an extended hiatus from blogging. Although I haven’t posted any new content for the last several weeks, this time has not been spent idly. Summer is a great time to work on various projects and get in lots of focused practice sessions. Here’s a brief list of what I’ve been up to this summer. New Arrangements: Two have been submitted for publication, and I anticipate sending in a couple more by the fall. More details once they’re in print! 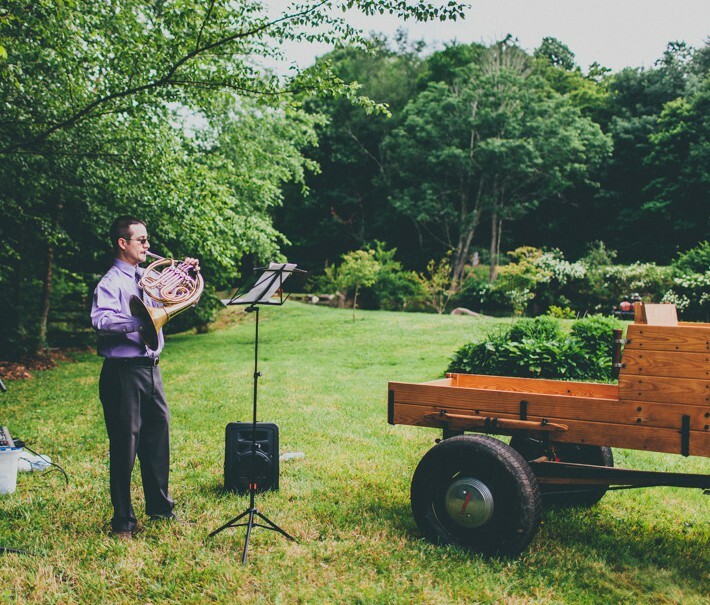 Wedding Season: In June I was invited to play at a good friend’s wedding. We became friends in high school band, and have stayed in touch for the last 2o years. My wife and I had a great time catching up with old friends and celebrating at the reception. Here’s a a picture of me playing some pre-ceremony music. Photograph by Urban Bloom Photography. Practicing: A short run of Les Misérables coming up at the beginning of August, and a faculty recital (Music for Horn and Organ) coming up in early October. More details on this recital in a future post. Brass Trio Article: I recently submitted an article to The Horn Call titled “Brass Trio Repertoire: Beyond Poulenc.” For a while now I’ve been planning to put together a list of original brass trio compositions, and I hope that others find the article useful. The story behind the title is that I’m often asked by colleagues what other good works are out there for brass trio in addition to Francis Poulenc’s Sonata for Trumpet, Horn and Trombone. The short answer is “a lot!” For part of the article I put together my personal “Top 10” list of works that I consider basic repertoire. Such lists are of course arbitrary, but if you’re looking for music to play in a brass trio in addition to the Poulenc this is a great place to start. Here’s the list, in alphabetical order. Where available, I’ve included a link to a live performance of the work. Another portion of the article includes a list of currently or recently active ensembles, with links to their websites, if available. This is only a partial alphabetical listing, and I’m sure there are many other fine groups out there. If you are a member of an active brass trio I’d love to hear from you and chat about repertoire. If this brief look whets your appetite for more information about brass trio music, be sure to check out the article in a future issue of The Horn Call! I’ll only post sporadically between now and the beginning of the fall semester, but plan to resume a more regular writing schedule once school begins. Enjoy the summer! Are you interested in trio arrangements or originals only? I have compiled a book of arrrangements for hn & organ also that I’ve tried to get published but no takers. Got tired of being asked to play weddings and funerals with no music. Let me know when you have a moment, thanks. Thanks for reading! For the purposes of my article I only focused on original brass trio compositions, but there are certainly some very good arrangements out there. Would also be interested in seeing your Horn and Organ arrangements. I’ll contact you through email. I’m looking for Brass Trio arrangements of pieces by major composers from Baroque through Romantic periods. Can you help me? Bought those already. good stuff. looking for Romantic period.